Heavy duty hand soap for serious clean-ups. 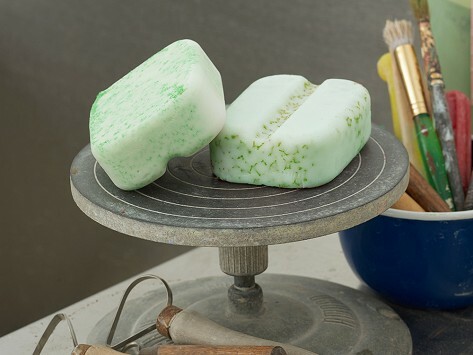 This pack of two hefty bar soaps is built tough to tackle things like paint, grease, and dirt and has a built-in scrubber to double down on cleaning. A finger rail helps you reach all the grimy spots and there are three levels of intensity to pick from. Soap all gone? You can still use the scrubber. Dimensions: Each: 3.75" x 3.75" x 2.75"
Glad you found this product! My crew and I love this product. Makes washing your hands enjoyable and not so much of a chore. I am a painter by trade and started using this product and was amazed at how well it works. I have used all the liquid and pumiced based products over the years and this is hands down better. Also, i brought how for my wife to try, and she loves using it for cleaning tub, tile sinks, exfoliating, etc. I just stumbled across Surly Soap on your site. We have purchased these bars before from a different retailer so we know what they are all about. Its nice that you offer them in 2 packs, and multi packs which you cant find in the stores. I love my husband but sometimes i feel like i married a caveman. Surly cleans better than any bar soap we have ever used. It was a little rough starting out but once you get to the expose scrubber it really starts to clean. Each hefty bar of soap has a built-in scrubber that’s doubly tough when you’re cleaning up. Neil and Skye are particularly proud of this addition that took them two years to get just right. A finger rail hits hard-to-reach spots and there are three levels of scrubbing intensity to pick from. Soap all gone? The scrubber lives on.